Among the many refinishing services we offer, staircase refinishing is one of our specialties. Many people have hardwoods floors in their homes but have carpeted staircases and upstairs hallways. At Flooring Service Group, we specialize in sanding, staining, or re-staining, and finishing your wood floors with polyurethane. 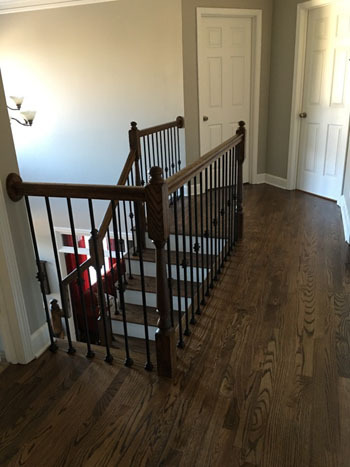 We are happy to allow you the opportunity to upgrade your staircase, handrails, and balusters. The luxurious look of hardwood steps and handrails will drastically improve the look and feel of your home. Our process for supplying you with beautiful wooden floors involves a few steps, starting with removing carpet, if necessary, or removing the original finish. The next step is sanding down the wood to its primary, bare state. After smoothing this level by means of sanding, we apply a coat of the stain that our client has chosen. Multiple coats of the polyurethane will be applied, with sandings in between. The sanding performed between each layer is done using a very smooth sandpaper that allows us to remove all of the small imperfections, but still keep the natural grain and integrity of the wood. The final part of the process is to buff the wood that's been stained. Buffing allows us to remove any dust or dirt and make the floor shiny as possible. 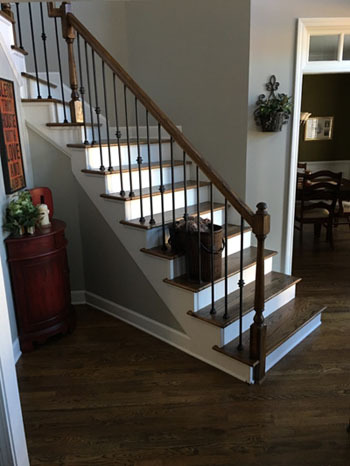 Much like the staircases and upstairs hallways we refinish, Flooring Service Group can also refinish your staircase's handrails to match your new floor or steps. If you don't have hardwood floors or steps, your handrails can still be refinished to a new color. The handrails can be refnished and upgraded to wrought-iron balusters, or you can maintain your ordinary, white spindles. Adding the bold look of iron balusters to your staircase can really complete your home's theme. Wrought-iron balusters come in a variety of styles and shapes so that you may customize your install. Though not all homes have iron balusters and they may seem outside the box, it's and upgrade that is sure to get your home and your sens of style noticed. Our work is guaranteed and your satisfaction is our number one priority. We strive to give the best style and quality, with the best attitude, at competitive prices.